The third transportation vehicle for NASA’s Commercial Resupply Services 2 contracts for resupply efforts of the International Space Station has passed a major ground test milestone at Edwards Air Force Base, California. 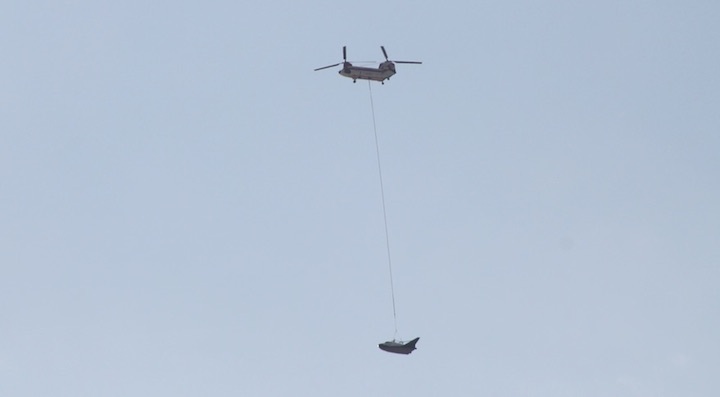 Completing a 60 mph (96.5 k/h) tow test earlier this month, Sierra Nevada Corporation’s Dream Chaser mini-spaceplane is now aiming for a series of Captive Carry flight tests suspended underneath a 234-UT lifting commercial helicopter. After its initial reveal earlier this decade, Dream Chaser’s long-term prospects were relatively grim following NASA’s decision to pass on the spaceplane as part of the 2014 Commercial Crew Transportation Capabilities contracts for the International Space Station (ISS). Despite that setback, Sierra Nevada Corporation pushed forward with development of Dream Chaser on its own and secured an unfunded Space Act Agreement (SSA) with NASA to continue cooperative development of Dream Chaser. This SSA worked significantly to Sierra Nevada’s favor when NASA solicited bids for its Commercial Resupply Services 2 (CRS-2) contracts. For CRS-2, Sierra Nevada submitted a proposal to use Dream Chaser in its uncrewed, cargo-only configuration. Initially, NASA was expected to award only two CRS-2 contracts; however, the agency formally announced in January 2016 that three companies would be awarded contracts – including Sierra Nevada for Dream Chaser alongside current CRS-1 contract holders SpaceX and Orbital ATK. With CRS-2 contract flights scheduled to begin No Earlier Than 2019, Sierra Nevada is proceeding with a final testing sequence of Dream Chaser – capitalizing on previously conducted tests of the Engineering Test Article (ETA) of the spaceplane. The series of ongoing tests at Edwards Air Force Base, CA, mark the second time the Dream Chaser ETA has been present for testing at the desert facility. 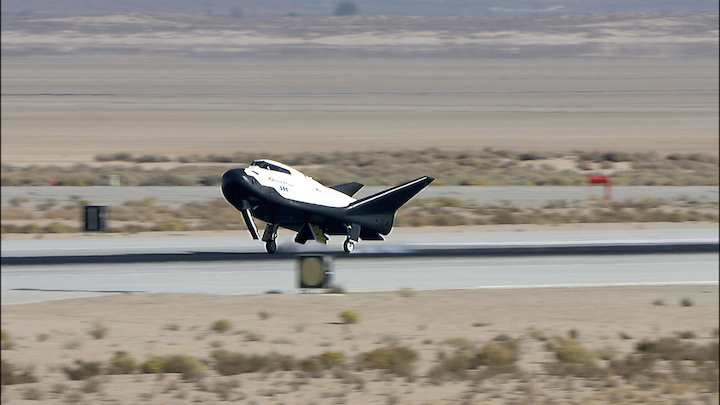 Back in 2013, the Dream Chaser ETA went through a very similar series of tests at Edwards, culminating in the craft’s first free-flight test on 26 October 2013. 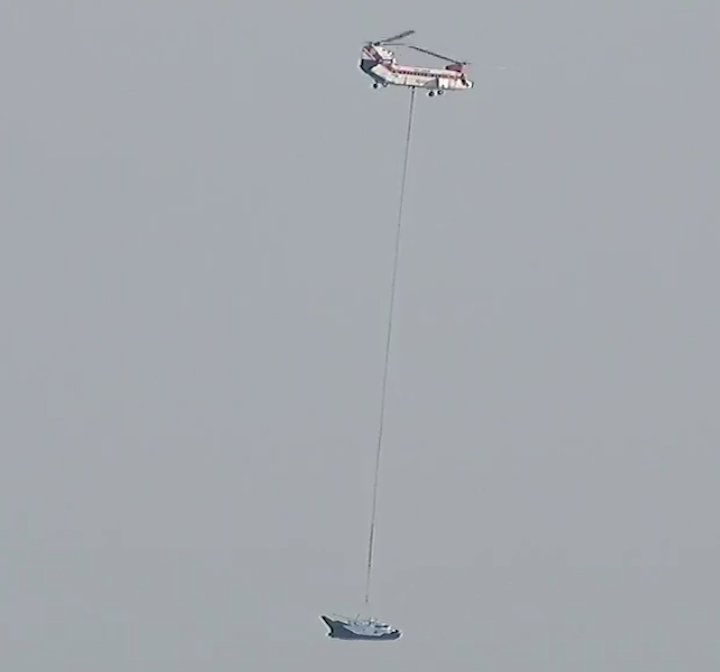 That October 2013 test saw Dream Chaser hoisted to altitude underneath a helicopter before being released for an autonomous flight to the runway. 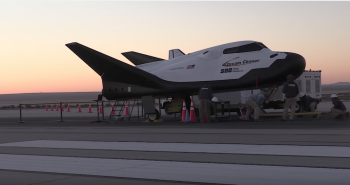 The test was designed to verify and validate Dream Chaser’s low-atmosphere aerodynamics, flight control surfaces, flight characteristics for approach, flare and landing, and landing systems. During this to date only free flight, the space plane flew itself toward the ground and runway for a landing approximately one minute after release. However, as it approached the runway and landing gear deployment was commanded, the left landing gear failed to deploy fully, resulting in the vehicle skidding off runway 22L at Edwards. Post-test recovery of Dream Chaser showed that while the craft suffered minor damage, the crew compartment was intact and all of its systems were still operational. Unintentionally, the landing gear failure accidentally demonstrated Dream Chaser’s ability to safely protect its crew/cargo and survive a landing gear out scenario at landing. While the 2013 tests of Dream Chaser were deemed a success by both Sierra Nevada and NASA (despite sliding off the runway), Dream Chaser’s teams have elected to repeat the craft’s ground and flight tests in an effort to gather more data and fly Dream Chaser in a more robust flight environment. Since arriving at Edwards earlier this year, Dream Chaser’s refurbished ETA has been used to validate numerous ground processing activities on the vehicle and has recently completed a major milestone test. That test saw Sierra Nevada engineers hook Dream Chaser up to a separable towing mechanism to allow the team to gather data on stresses and responses on the vehicle to various towing speeds as well as its final landing elements (i.e., how it decelerates in its final moments of landing). During the test earlier this month, a pickup truck towed Dream Chaser’s ETA to a total speed of 60 mph (96.5 k/h), performing several s-curve ground turns before initiating a release of the tow mechanism to allow Dream Chaser to slow to a stop on its skid strip and tires. Now, teams are preparing for a series of two Captive Carry tests ahead of the free flight Approach and Landing Test 2 (ALT-2) for Dream Chaser. While teams continue to work off “open issues and perform regression testing of flight components and software in preparation for ALT-2”, according to an update on L2, Sierra Nevada’s teams are understood to be targeting late-September for the ALT-2. 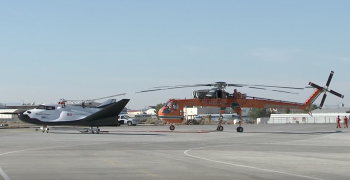 Moreover, the helicopter that will be used for both Captive Carry tests and for ALT-2, arrived at Edwards Air Force Base in mid-August and is very different from the one used in 2013. That helicopter was an ERICKSON S-64F. The new copter is a 234-UT lifting helicopter – the civilian version of the CH-47 Chinook. The 234-UT is capable of lifting 11,793 kg (26,000 lb) and of attaining a cruise speed of 120 kts (222 k/h – 138 mph) – something that will aide Sierra Nevada in their desire to use ALT-2 to send Dream Chaser through a more robust flight environment on her short, one minute flight from altitude to the runway. But before ALT-2, the 234-UT will lift Dream Chaser to altitude, performing two Captive Carry test. According to updates available in L2, “Two ETA Captive Carry tests in work, no specific dates at this time.” However, this week SNC noted the first test will be conducted on Wednesday. During the Captive Carry tests, Dream Chaser will be suspended below the 234-UT while the helicopter flies a pattern at various altitudes within the perimeter of Edwards Air Force Base. “One of the primary objectives of the first Captive Carry test is to verify and validate the performance of the ETA Guidance Navigation and Control systems and to exercise operations of the ETA under the control of the flight control team while in an actual flight-like operational environment,” notes the L2 update. If those two Captive Carry test are successful, Sierra Nevada will move on to ALT-2 at the end of September. Currently, if funding levels and schedules hold, Sierra Nevada anticipates the first cargo Dream Chaser flight to the ISS in 2020. The current CRS-2 contracts grant Sierra Nevada, SpaceX, and Orbital ATK six flights each for resupply services to and from the Station – for a total of 18 commercial cargo runs between 2019 and 2024. Under the CRS-2 contract, Dream Chaser will provide a total cargo uplift capability on each flight of 5,000 kg (11,000 lb) of pressurized cargo and 500 kg (1,100 lb) of unpressurized cargo – with a recoverable downmass cargo capability of 1,750 kg (3,860 lbs) and a disposable cargo capability of 3,250 kg (7,170 lb). Moreover, Dream Chaser has been selected by the United Nations to fly uncrewed microgravity science missions for nations that don’t have domestic access to space (the first of which is expected No Earlier Than 2021), and the Trump Administration in the United States is understood to be studying a proposal set forth by Sierra Nevada to use of Dream Chaser for a crewed servicing mission to the Hubble Space Telescope in the 2020s. EDWARDS AIR FORCE BASE, Calif. — Sierra Nevada Corporation (SNC) carried out a successful captive carry test Aug. 30 of its Dream Chaser vehicle, a key step towards a glide flight of the lifting body spacecraft later this year. The Dream Chaser engineering test article, slung underneath a civilian variant of the Chinook helicopter, took off here at 10:21 a.m. Eastern. It landed at 12:02 p.m. Eastern, with the company declaring the flight a success. During the test, SNC collected data on the vehicle’s performance in flight, including operation of radar altimeters, air data probes and other systems that cannot be fully tested on the ground. The captive carry test followed a series of tow tests here in recent months, where the vehicle was towed behind a truck down a runway at speeds of up to 100 kilometers per hour. This captive carry flight is one of the final steps before a free flight, where Dream Chaser will be carried aloft by the helicopter and released to make a runway landing. That glide flight is the remaining funded milestone in the company’s Commercial Crew Integrated Capability (CCiCap) Space Act Agreement with NASA that the agency awarded in August 2012. A second captive carry flight, expected to take place in about a month, will incorporate lessons learned from this flight, the company said. That will be followed by a free flight test before the end of the year. Dream Chaser has performed one glide flight previously, in October 2013, as part of an earlier Commercial Crew Development award. The vehicle landed on the runway here but skidded off when part of its main landing gear collapsed. The vehicle did not suffer significant damage, and both the company and NASA considered the flight a success. The vehicle that flew on its captive carry flight is the same as the one used for the 2013 tests, after repairs and upgrades. The vehicle now has the same avionics system that the company plans to use on its orbital vehicle, Lindsey said. 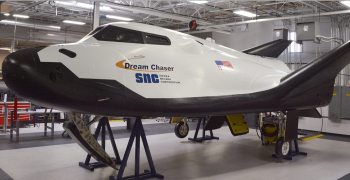 SNC developed Dream Chaser to transport astronauts to and from the ISS. However, NASA instead selected proposals from Boeing and SpaceX in September 2014 for full-scale development of those vehicles. SNC filed a protest with the U.S. Government Accountability Office about that decision, but the GAO rejected the protest in January 2015. The company has since been focused on development of a version of the vehicle to transport cargo. NASA awarded SNC a Commercial Resupply Services (CRS) 2 contract in January 2016, joining existing cargo providers Orbital ATK and SpaceX and guaranteeing the company at least six cargo missions between 2019 and 2024. The cargo version is similar to the crew version, but includes a separate module attached to the rear of the vehicle to carry additional cargo. SNC announced July 19 it signed a contract with United Launch Alliance for the first two launches of Dream Chaser cargo spacecraft on Atlas 5 552 rockets. 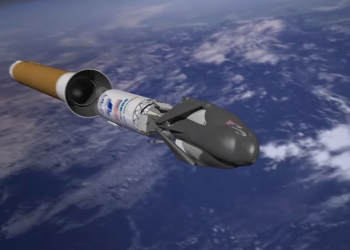 The first launch is scheduled for 2020 and the second in 2021, although Lindsey said that NASA has not formally ordered any Dream Chaser flights under its CRS-2 contract yet. While SNC is focused for now on developing the cargo version of Dream Chaser, the company has not closed the door on developing a crew version. Lindsey said the company recently signed a five-year unfunded extension of its CCiCap agreement with NASA to support potential future development of a crewed vehicle. “We have some unfunded milestones where NASA will come in and look at our requirements and how we’re developing our cargo vehicle, look at the path or trace to the crewed vehicle, and help us out,” he said of the extended agreement with NASA. Sierra Nevada Corp. conducted a captive carry test flight of the Dream Chaser spaceplane Wednesday at NASA’s Armstrong Flight Research in California. About one-quarter the length of a space shuttle orbiter, the Dream Chaser is being developed to ferry cargo to and from the International Space Station. After blasting off on time of an Atlas 5 rocket, the ship will return to land on a runway. The automated spacecraft was lifted airborne Wednesday by a dual-rotor Boeing Vertol 234 helicopter operated by Columbia Helicopters. 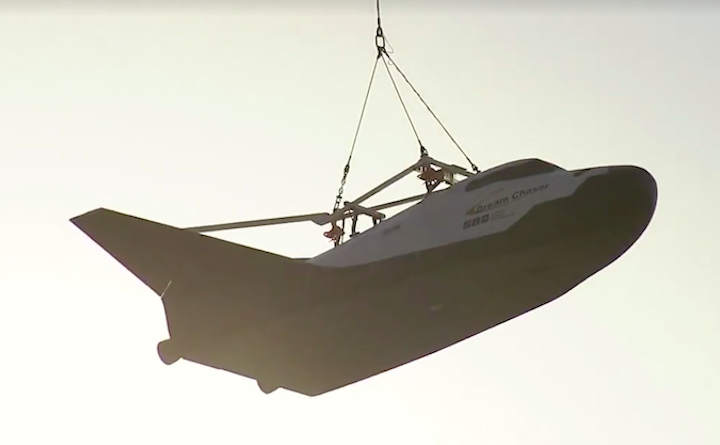 The “captive carry” test flight was expected to be used to test out telemetry and control systems before a planned drop test later this year to demonstrate Dream Chaser’s ability to make an autopilot approach and landing to a runway. 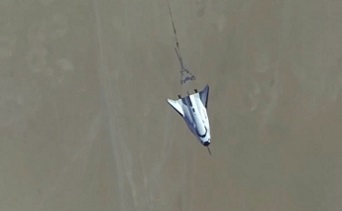 The captive carry test comes after a series of tow tests at NASA’s Armstrong facility, co-located at Edwards Air Force Base in California’s Mojave Desert. 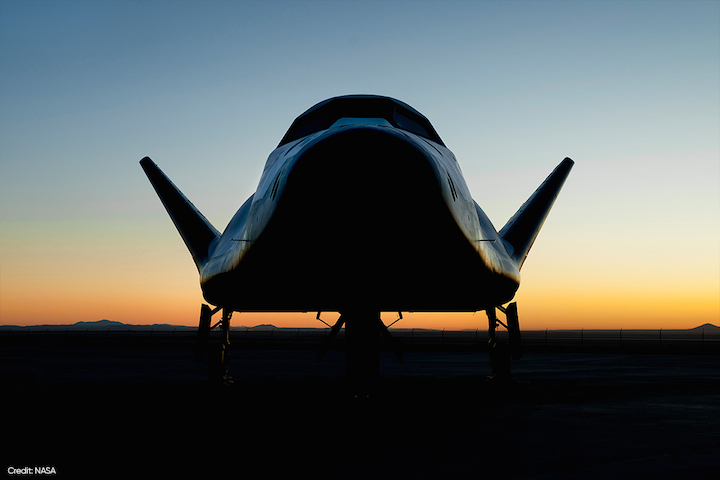 Sierra Nevada plans the first orbital flight of Dream Chaser to the space station in 2020. Suspended under a 200-foot lift line, the 30-foot-long (9-meter) test craft flew around the dry lake bed at Edwards Air Force Base, making several high-speed and high-altitude passes to test out the ship’s aerodynamics and simulate the conditions needed during the approach and landing demonstration later this year. “On-board the vehicle, we have all the orbital vehicle avionics,” said Steve Lindsey, senior director and co-program manager for Sierra Nevada’s space exploration systems division. “The avionics on-board are identical to what we will have on the orbital vehicle, as well as the flight software for the orbital vehicle. Sierra Nevada webcast the start of the test live, but the company ended the video stream shortly after takeoff. The vehicle made a safe landing after about an hour-and-a-half airborne. “We are very pleased with results from the captive carry test, and everything we have seen points to a successful test with useful data for the next round of testing,” said Lee Archambault, a former astronaut and Sierra Nevada’s director of flight operations for the Dream Chaser program. The current testing in California comes four years after Sierra Nevada conducted similar flight tests when the company aimed to fly Dream Chaser with astronauts on-board. The Dream Chaser test vehicle made an on-target approach to a runway after letting go from its helicopter carrier, but one of the craft’s main landing gear failed to deploy, leading the spaceplane to spin out of control after touchdown. 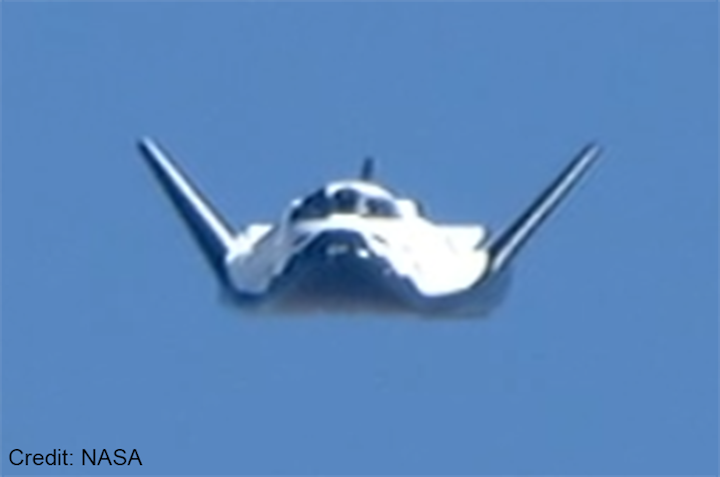 Sierra Nevada says the 2013 flight was successful until that point, and Dream Chaser’s autopilot landing system steered the craft toward the runway for a touchdown on the centerline. Engineers blamed the mishap on a landing gear borrowed from a U.S. Air Force F-5E jet. Future Dream Chaser cargo missions to the space station will fly with a different landing gear, and the refurbished spaceship now in California features a gear more advanced then the one at fault in 2013. Engineers also upgraded the ship’s computer systems to be more like the orbital version of the Dream Chaser. At least one more captive carry test is planned before the free flight, which Lindsey said must be conducted in cooler weather than the scorching temperatures Wednesday in the Mojave Desert. 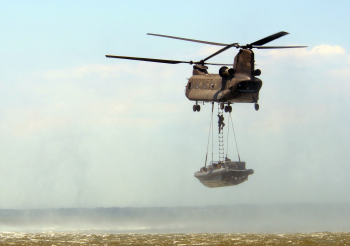 The carrier helicopter’s lift capability is limited by hot temperatures. Sierra Nevada also plans a release test using airbags before the Dream Chaser’s approach and landing flight to check out the drop mechanism. WASHINGTON — Sierra Nevada Corporation is expected to perform a second glide test of its Dream Chaser vehicle as soon as next week, according to comments from a NASA official. Bill Gerstenmaier, NASA associate administrator for human exploration and operations, said at a House Science Committee hearing Nov. 9 that the glide flight of the uncrewed vehicle, at Edwards Air Force Base in California, was planned for Nov. 14. “They have a drop test on the 14th of this month to look at their vehicle coming back,” he said when asked about the company’s work by Rep. Ed Perlmutter (D-Colo.) at the hearing. A company, in a statement to SpaceNews, didn’t confirm the date Gerstenmaier provided during the hearing, but said that preparations for the glide flight are continuing. “We are still on schedule for a free-flight test this year,” the company said, with the timing depending on factors such as availability of helicopters used to support the test as well as access to NASA and Air Force facilities. The glide flight will be the second for this vehicle, an engineering test article originally developed as part of Sierra Nevada Corp.’s commercial crew activities. On the first flight, in October 2013, a helicopter released the Dream Chaser at an altitude of about 3,600 meters, allowing it to glide to a runway landing at Edwards. The test, though, was marred by the failure of one of the vehicle’s landing gears to deploy, causing it to skid off the runway after touchdown. The vehicle suffered only minor damage, though, and both NASA and the company considered the test flight a success. Sierra Nevada Corp. shipped the Dream Chaser, after repairs and other modifications, to NASA’s Armstrong Flight Research Center at Edwards early this year for testing leading up to a second glide flight. That flight will be the final funded milestone on the company’s Commercial Crew Integrated Capability award made by NASA in 2012. 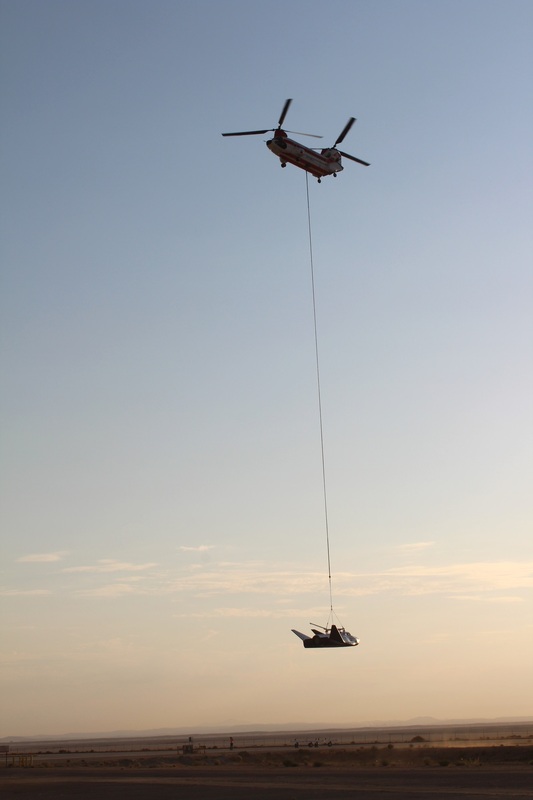 The company performed a captive carry flight Aug. 30 at Edwards, carrying the vehicle aloft under a helicopter for nearly two hours. That test was performed with media present and broadcast on NASA TV. A second captive carry test, without outside coverage, took place about a month later. 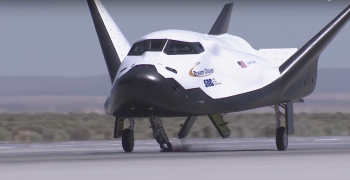 While Sierra Nevada Corp. failed to win a commercial crew contract, which NASA awarded to Boeing and SpaceX in 2014, it subsequently won a Commercial Resupply Services 2 cargo contract with NASA, along with Orbital ATK and SpaceX, using a version of Dream Chaser. The company’s first two cargo missions are planned for 2020 and 2021, launching on a United Launch Alliance Atlas 5. 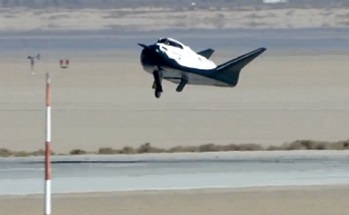 Sierra Nevada Corp’s Dream Chaser lands on Edwards Air Force Base in California. Spacecraft went through preparations for flight at NASA’s Armstrong Flight Research Center. Sierra Nevada Corp.’s Dream Chaser spacecraft underwent a successful free-flight test on November 11, 2017 at NASA’s Armstrong Flight Research Center, Edwards, California. The test verified and validated the performance of the Dream Chaser in the critical final approach and landing phase of flight, meeting expected models for a future return from the International Space Station. The flight test helped advance the vehicle under NASA’s Commercial Crew Program space act agreement, as well as helped prepare the vehicle for service under NASA’s Commercial Resupply Services 2 program. 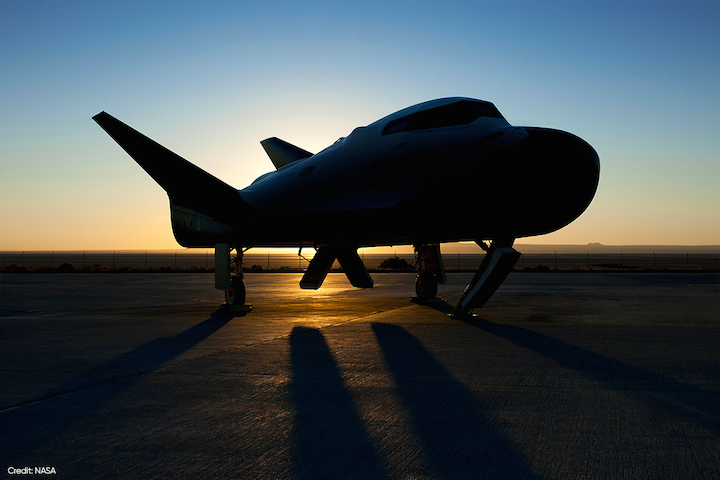 The testing will validate the aerodynamic properties, flight software and control system performance of the Dream Chaser. The Dream Chaser is preparing to deliver cargo to the International Space Station beginning in 2019. The data that SNC gathered from this test campaign will help influence and inform the final design of the cargo Dream Chaser, which will fly at least six cargo delivery missions to and from the space station by 2024.